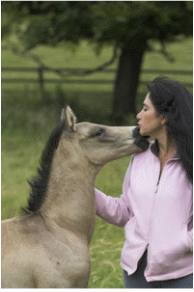 and into the grace of your heart "
Safaya Salter from "How to Create Real Heart Connection with Horses"
This is not training or a method but it does allow any training that really supports the horse's physical and emotional growth to come more easily. Once the connection is achieved the possibilities are endless. Drilling a horse to respond to your cues is not relationship and the difference, once you've experienced it, is undeniable and magical. Why settle for less when that's what the horse is offering. Whether you're committed to this sort of approach or want to pay token respect to these ideas I welcome you on which ever part of your journey you find yourself. Just being with your horse without asking anything will, in itself, help to put you into a relaxed realtionship. Your horse will appreciate this time you share more than you could possibly know and this is a good way to start but if you want to take your relationship beyond the norm then you may need more quidance. I will share a few thoughts from my upcoming book on the subject, working title being "How to Create Real Heart Connection with Horses". by asking yourself this question. What role do you want your horse to fill in your life? If you think this is a strange question just think again and in the privacy of your own time examine what you really wish your horse to mean to you. Are you hoping that she/he will be a companion, a therapist, a diversion, a commodity, a vehicle for your success, or a substitute for someone who is missing in your life? How much agenda are you holding with this? If you were your horse would you want that sort of pressure, no matter how apparently 'loving' it was intended to be? The 'ask' we don't know we're asking is significant to the horse and our relationship is therefore coloured by that at the start. Learning to offer an open heart without agenda is the secret of any real and lasting relationship and certainly the secret of heart-based horsemanship. If you'd like to know how to achieve this then you're in the right place. If you answered 'a companion' you're half way there. There is so much disappointment involved in dealing with horses for those who are not grounded in their hearts and who are operating from conclusion. Years of conditioning as to what 'horsemanship' is all about and then what 'natural horsemanship' is all about have created a conclusive idea about having a relationship with horses that has at its foundation the idea of dominance. This usually also includes the idea of supremecy and that the horse doesn't have emotions as such but can nevertheless get angry, agressive and dangerous. Interesting point of view but not one that exhibits much true understanding. If you're beginning to question this approach then you'll find another way to be with your horse here and start on the path that leads to that wonderful peace which comes with a deeper understanding. Go to About Safaya for more insight into how I work and Contact me if you'd like to know more.